If I had a million dollars I would buy… We all have thought about it, talked about what we would do. Notoriously someone in the group will always say “I would just live off the interest” and they’ll use some math that makes the interest sound like a lot of money. But can you really “live off the interest”? How much interest will I earn on 1 Million dollars? It’s important to note that there is a difference between what interest actually is, and what people typically think of an interest. Capital Gains are defined as the profit from the sale of property or investment. So if you buy a house for $50,000 fix it and sell it for $100,000 your capital gains are $50,000 (this is very basic and there’s much more that goes into it, but for ease of argument bare with me). What most people think of is the stock market, buying and selling for the capital gains. Though yes this is possible to do, especially if you are starting with 1 million dollars, it isn’t interesting. Dividends are amazing, and dividend-paying stocks even give you the dividend yield as a percentage. This may lead to even more confusion when it comes to how much interest you earn because though it seems like a dividend yield of 3.4% is 3.4% interest that isn’t at all the case. Yes, it’s a solid investment and a great way to make passive income, but again no interest. Interest is money paid regularly at a particular rate for the use of money lent. In other words, interest is money paid to you for allowing others to use your money. How Much Interest Will I Earn On 1 Million Dollars? 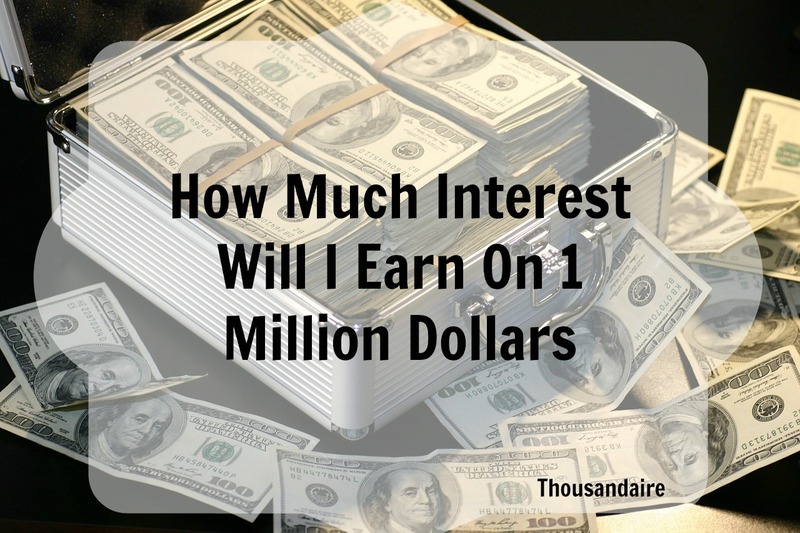 With what interest really is in mind, the question now is how much interest will I earn on 1 million dollars? Well, that depends on where you put your money, so let’s break down 5 places you can have your money and how much interest you’ll get from each. According to NerdWallet’s rating of 17 online checking accounts, interest rates range from 0.10% to 1.5%. So getting a calculator out will bring interest on a million to $1,000 to $15,000. Savings accounts don’t offer much more than checking accounts ranging from 0.9% to 1.3% or $9000 to $13,000 annually. Money market accounts run right about the same as checking or savings with the highest I was able to find of 1.31% bringing in $13,100 annually from interest. The highest of the interest rates you’ll find with the highest I was able to find of 2.35% would bring in $23,500 annually. However, you would have to invest in a 5 year CD meaning you wouldn’t be able to collect any of the interest for 5 years. The best thing would be to create a CD latter so that every 6 months you could be collecting interest. With the average household income over $52,000, the amount of money you would get from interest on a million dollars wouldn’t allow you to quit. However, there are other ways to make money from a million dollars, other ways to care for your bills using that million dollars. In an upcoming article, we will discuss how we can live off of 1 million dollars. By Tyler Philbrook|June 12th, 2017|Categories: Blog|Comments Off on How Much Interest Will I Earn On $1 Million?